Discussion in 'Christmas Countdown' started by made582, Nov 19, 2013. When I was young, my mother would always say to me.. " Don't forget why you're here.." It was a reminder to " do the right thing... which was to help people- to manke the world a better place" The holidays appear to me to be the time that people suddenly remember 'why they're here.."- Charity- helping the neighbor- making your home more inviting- and giving. In a world that is more and more corrupt- and dysfunctional in so many levels, there still exists this small corner of cyberspace, where year long, we all meet and even at times find ourselves scrambling from site to site to continue a commitment that we made years ago with each other. We watch as for a small period of time, people stop-and take in a wonderment that we celebrate year long. That's why I continue to come here- and celebrate.. it's because my mother still whispers to me " Don't forget why you're here.."
We gather at this site day in and day out counting down the days till our beloved season begins. Our leader, Crown, guides us through the many months, weeks and now days until we welcome the Christmas season with full hearts, hand in hand. We belong here. Look forward to seeing what our friends have been up to. Looking forward to the chuckle that we might get, feeling as if we are amongst our friends. We are amongst friends. Cyber friends who have stuck together for years, chasing each other through cyberspace so that our community does not splinter. And we are a community. Each of us supporting and loving the other. It has always been my distinct pleasure to be part of this group. We've grown to truly love one another...And none of us has even met in person. Just goes to show you the power of honesty. The power of Christmas, the power of those who keep the spirit in their hearts year round. And so my friends, help me welcome day three of the countdown! Three days until our season comes round again. Thanks for being here! It is one of my great pleasures in life to be part of this fine group! Merry Christmas! I see our journey through the year, indeed through life, as akin to an ocean voyage. but can involve hard work. Just as sailors have their favorite ports along the way, so do we have our favorite holidays. favorite is CHRISTMAS! It is the BIG island. The one with the most to offer. embark on the next annual trip. all, it is the fellowhip and love of my family and friends. A time for togetherness and renewal. voyages there are left for us and what they will bring. ..........And ultimately, what will be wating for us at that big unknown final destination when we leave the ship for the last time. guide each other along the way. Thank you for being my fellow passengers this year. .........And so we arrive at Day 2 before our Christmas Season. "May the calendar keep bringing happy holidays to you". Welcome to Day One of our official start to the season (begins tomorrow)! I have always been a lover of Christmas. Thankfully my parents were Christmas crazy too. Likely where I got most of my love for the holidays from. My mom decorated the house traditionally in her special way and my father took care of the 12 foot tree. We had a "kiddie tree" in the family room to decorate with nontraditional ornaments (Disney figures, school crafts, etc.) As an adult, Christmas became a time of family bonding and fellowship with my parents' friends, (ours were welcome too) relatives and neighbours. Carollers would come to our door and we ventured to other neighborhoods to raise money for the local Santa Fund. Since I was a young teenager, I would sit quietly by the Christmas Tree and reflect on Christmases past and for me that would include family members who were no longer able to celebrate the holidays with us. One year, my father was coming upstairs from the family room and saw me sitting in the living room. I startled him because he didn't realize I was there. It was dark with the exception of the lights on the twelve-foot Christmas tree. He asked, "Why are you sitting all alone in the dark?" I replied, "I'm not sitting in the dark, the Christmas Tree Lights are on. I'm just thinking about things." My dad went upstairs to change into his pyjamas and came back and sat down on a chair in the living room. He said, "I think I'll just sit here for a little while and think about things too." We were silent for a few minutes and then had one of the most memorable chats we've ever shared about our Christmases past. I realized that the people gathering, the Christmas music playing in the background and exchanging stories were as special to him as they were to me. Who else would understand or care about what I just shared? Christmas lovers care and share their memories and plans for the future too while waiting out the days until the next Christmas. When the Ebenezer’s of the world experience Christmas spirit, they are often reminded of the first gift of love that was offered so long ago. For those of us who live with Christmas in our hearts all year long , we can support their seasonal joy by accepting them into our festive forums and our glad hearts. The scene in It’s A Wonderful Life, when Zuzu looks up at her daddy (George) and says, “teacher says, every time a bell rings, an Angel gets its wings” reminds me how I feel. Every time a new member arrives or an old one returns, a Christmas chime plays in my head to welcome them. The holiday season is officially upon us (tomorrow) and it comes with the opportunity to celebrate the wide variety of personal and traditional celebrations that our families (members) enjoy. As Christmas enthusiasts, we are always eager to learn and discover the traditions celebrated by our new friends, and endeavour to create a festive community where all feel welcome and “at home”. AuntieMistletoeDear, Maebeary, lilnoelelf and 12 others like this. I shall open the 5-day lead-up to the Season with a tale of my earliest memory of Christmas. It was Christmas Eve in the late 1950's. I was about 5 years old and we were living in Orlando, Florida with no fireplace/chimney. I can remember being concerned that Santa couldn't get in to make his deliveries. On asking my parents how he would manage it, I was told he uses the front door in houses without chimneys. Noticing that the door was latched, I asked that it be left unlocked for the night. They complied and I went to bed happy and secure in the knowledge that Santa would not have to pass up our house! Isn' t this a big part of what Christmas is made of? Our memories. So much of our childhood is forgotten over the years but I'll bet most everyone can come up with at least one early memory of Christmas! These happy thoughts help to warm us as we "grow a little older and grow a little colder". They are one of the little angels sitting on our shoulder. .....And so we arrive at day 5 before the Season. In the midst of the holiday season, we cross the Winter Solstice... the longest night of the year and the equinoix where we go from"the dark into the light.." When we awaken on December 22nd, we are hours away from Christmas Eve and the day that we begin looking towards all year. An on line community like this reminds us that in the darkest of hours and when despair seems to grip us, there is light with friends who believe and share in the power of the holidays and the togetherness that exists, not just during the season, but year long. During my darkest hour, my friends here rallied around me and pulled me up... reminding me that there is a season of light yet to come and the friendships that endure is the real meaning of the season. I’ve been thinking long and hard about what I would post for Season Day – 3. Crown has already brought back those warm childhood fuzzies from when we were kids. Binger reminded us that no matter how dark things may be, you always have your friends to turn to. We not only have the day, but the season and, indeed, for some, a whole year. We not only have our physical friends but our virtual ones as well. We are more blessed than many. Christmas is the most snuggly time of the year for me. This holiday celebrates family and giving thanks as much as Thanksgiving Day does, yet thankfully lasts that much longer. Some Christmas celebrations include sleigh rides, hot cocoa, fireplaces, and building snow people in the yard while other people could be sailing and building sand castles. It’s a time for festive parades, visits with Santa, shopping and family vacations. It’s a time for great music, reading, watching special movies or listening to cherished stories and exchanging memories. I believe that people who gather with similar attitudes can enjoy their reflections and plan ahead for the next Christmas easier than those who live among people who feel forced to celebrate and do not enjoy the merriment of the yuletide cheer the way we do. I believe that every home should smell like pine trees, pumpkin pie, cookies baking in the oven, Scotch tape, turkey and Clementine oranges. When I think of Christmas as a child, it brings back days when we left our back doors open just in case a neighbour needed to borrow some tools, milk, sugar, lemon loaf or wine. Days when simple gifts were exchanged - most of them purchased from Kresge's, K-Mart, Zellers, Sears, and Consumer's Distributing. Days when my brothers and I would pour over the Sears Christmas Wish Book for hours upon hours, flagging nearly every page in the toy section. Days when we made Christmas commercials for our dad's clothing store. Days when nearly everyone we saw walking along the snowy sidewalks downtown were familiar faces. Back when the church bells seemed to sing to each other across the city, “come, listen, sing and rejoice”. The days when we heard the updates from NORAD on TV telling us it was time to get to bed because Santa was over Nova Scotia (where my grandparents lived) and we knew it wouldn't take long to for him to reach us. I wish you and yours a cherished reflection and continued joy in your future celebrations and thank you for keeping Christmas in your hearts throughout the year and contributing to our festive community. And this brings us to Day 2 - that much closer to the start of our Christmas season in this very special countdown thread!!! And I leave the door open for JayIsh to arrive with his thoughts tomorrow. And so it comes to this...One day. One day until the rest of the world catches up with us and begins the process of preparing for the happiest, most sacred day and season of the year. We carry the torch for Christmas all year long...Protecting it, nurturing it, preparing it for the big unveiling that is the Christmas season. We join in cyberspace with like minds and hearts. Enjoying each others stories and traditions. Cheering each other on in good times and comforting one another in bad. Community at its finest. Life deals many cards. Some good and some not so good, but knowing that this community exists and prospers is a comfort that I could never explain to those in the outside world. We love one another in a way that few people who have never met can and it's all because of Christmas. I've been at this for many years and a good number of folks have been by my side for the whole time. Some were here before me and some came after but each of us belongs. It is the belonging that I cherish most! I'd like to say thank-you as well! Thank you to those that have been here all year and to those that come back as we get close. Thank you for being my friends, for listening to my rantings on the MCR station and for supporting me on days when I don't quite have enough to support myself. You are truly friends of mine! And so I say Merry Christmas Season...It begins tomorrow folks, and God bless us, everyone! AuntieMistletoeDear, Maebeary, whitney37354 and 9 others like this. Thanks for sharing these past memories, Made. So special! Maebeary, snowflake22, xmas365 and 6 others like this. Good morning my Christmas loving friends…..here we are just days away from the start of the season......A season that is so full of magic and awe that it strikes adults and children a like. A season that we wait all year for, that once it does arrive it seems to end so quickly. This year my one Christmas wish is for the season to take its time….to linger about while we enjoy and fully embrace the season and everything we love about it. I want more time to cuddle with our children while we are watching our favorite Christmas shows on TV. To bake all those beloved cookies that we make at Christmas…to pretend I did not see the little ones sneak a cookie or two off the cooling racks. More time to enjoy, too appreciate the sparkle that shines in our children’s eyes when they see the house all decorated and fully lit up, on Christmas Eve when they track Santa NORAD and then put out Santa’s milk and cookies, on Christmas morning when they see all those presents that seemed to magically appear under the tree that were not there the night before. So Father Christmas….this season please take your time so we may fully enjoy what the season is truly about and to be thankful for all the blessings we have in our lives! Merry Christmas Everyone! In our ever more rapidly changing world, we strive to find an anchor - something that stays the same. Like a rock to hold onto as the current washes us downstream to an uncertain future. Let's face it. The world is really changing too fast. There have been more physical, technological and cultural changes in the past 100 years than in all of man's history up to that time. Is it any wonder that those few things that do not change are so precious to us? Yes, it has evolved somewhat over our lifetimes, but far less than most institutions. It is something dependable. Always there. And always the same time every year. We are lucky and insightful here at My Merry Christmas. I feel our group truly sees the value of Christmas and seeks to hold it dear all year long. No, we are not crazy. We are smart and see the importance of Christmas and the Christmas Season. Thanks for being here this year, everyone, to hang on together to the rock that is Christmas. ........And so we arrive at Day 3 before Christmas Season 2009. This day one we set aside to remember and honor those who gave their lives so that we can live in freedom today. Christmas is a day we set aside to remember that a child was born who would one day give His life so that we could live in freedom. It is so amazing that one child could so influence this world. Almost everyone has heard about Him, whether they believe He is who He says He is or not. He came to give the ultimate gift of love, and that love has spread like a ripple in a pond after a stone has been dropped into it. Every Christmas we continue to add to that ripple of love, spreading it out ever further. I was just thinking about what we remember, about what makes us like or even love certain things. For example, I have no idea why I absolutely LOVE anything to do with Christmas. I mean, I could honestly listen to Christmas music 24-7 and never tire of it. Why is that?? And I know I am not alone. In fact, there are so MANY people, women AND men, who are so in tune with Christmas that they frequent this very website that counts down the days until Christmas! Can you imagine? Tonight I was speaking with several friends. I told them that I really want to complete my (Christmas) scrapbooking stuff before I die. I know, I know—we know not the day nor the hour—but I want to leave behind my legacy of my love of ALL things Christmas. When I speak with my third graders year after year, I realize what a happy childhood I had, how lucky I was. I felt so loved as a child. My parents managed a boat landing so we lived at the river year round in the South. We had four distinct seasons—cool and cleansing spring; hot and humid summer that equated with swimming everyday (!!! ); fall, beautiful fall and piles of leaves that invited diving (as opposed to summer diving! ); and winter—snow days and nights that were glorious. Just as if it were yesterday, I remember the crickets and the lightning bugs, the scent of honeysuckle, the ripple of the waves as boats passed the pier, the piles and crunch of dry leaves, the first fat flakes of winter and the bitter winds, and the first blossoms of dogwoods and honeysuckle! And the Christmas celebrations were homey and loud with so many cousins and aunts and uncles. Going back past the years that have hurried by, my memories crowd around me and make me remember about something I read, that the things that move us are the things that reflect what we already believe: That one equals many. That an individual is a part of the greater whole. That together we can do great things. That each of us, in some way, wishes to be part of something greater, something grander, than simply ourselves. I believe that is what we have here at My Merry Christmas. My, how things actually become the circle of life! AuntieMistletoeDear, Maebeary, snowflake22 and 7 others like this. The countdowns getting closer every day! Our Christmas Blossoms thread began again in September. And already is filling with some beautiful pictures. The countdown thread has reached the amazing post number of 12,980 going way over the amount anyone would have imagined when this forum began way back when Jeff was still a youngster. And have you seen what Santa is up to at the North Pole? NO?! Well take a trip to the “Christmas today” section of the forums and check it out!!! Have you met the Christmas crew that keeps this place humming so nicely? Get over to the front office and meet them all. And by the way, thanks to all of you for a fantastic job!!! Recipes, gift ideas, how to decorate, where to get the latest Christmas lights. Music, podcasts, videos and books. We have it all here at the touch of a button. As we enter the start of the Christmas season for 2010, I can not think of a nicer place to hang out than here on My Merry Chrismas.com. Turn up the music on Merry Christmas radio and just enjoy! Grab a mug of eggnog and a candy cane and join us on this special journey into the most magical time of the year. Christmas is more than a date on the calendar; it is a place in our hearts and our homes. It is a time to reflect on what is truly important to us. A chance to share our faith in the coming of a baby who would change this world forever. Welcome to the start of the 2010 Christmas season, the greatest show on earth!!! That's what the defenders of the season believe in: continuity. All year long, we celebrate here and hang on to that which brings us joy- a commonality of purpose. The rest of the world catches up in late November.. but here, we celebrate with each other every day of the year. As the world continues to move faster, we hold on to traditions passed down for generations. As people move further and further from that which is right and good, we celebrate the time of the year when all appears just perfect. There are so few things that we can hold on to that never seem to change. Loved ones leave us, kids grow and leave home, we almost want to stop ourselves and forget that it is the season.. that which continues to bring us joy and laughter each year, that is the reason why we seek out each other.. almost anyonymously.. and year in.. year out, we share the magic that is Christmas and we....... continue. and so it has come to this... 4 days until the season. ........let it snow, let it snow, let it snow!!!! For every ying, there is a yang – a heads for every tails. No matter how much fun (or hassle) you get from the slushy white stuff or, in the case of Scotland, lots of icy rain, you always come in from the cold. You find yourself making a hot drink, grabbing a few cookies and settling down to watch it all from the comfort of your own cosy couch with Christmas songs playing softly in the background and your tree all aglow. At the risk of sounding twee, that’s how I see MMC. Work and the real world and day to day stuff are the cold outside. There’re some good moments (equate it to making snowmen, snow angels and going carolling) and some not so good (hitting an icy patch on the road and sliding into a snowdrift). MMC is my hot drink, couple of cookies and cosy couch – it already comes with the Christmas music! I can relax, recharge and indulge in a little “me” time, psyching myself for the chilly great outdoors once more. It’s my year long Christmas indulgence that doesn’t leave me feeling like I’ve put on 6 lbs!!!! Making this special post in the final days before the arrival of the Christmas Season proper makes me feel like I can give a little back to the site and people from whom I’ve received so much. I’ve gone a little off course in my ramblings (so what else is new?!) but my wishes to you all are as warm as the chestnuts roasting in the open fire. Here endeth Day 3 – have a wonderful, wonderful season everybody and, guess what? It’s beginning to look a lot like Christmas!!! As you well know by now, Christmas is my absolute favourite holiday. I love it all from decorating to gift wrapping to Christmas music and movies ... and tend to celebrate the feeling of it throughout the year and have joined the countdown regulars in celebrating from mid-November, although I carry my countdown into the New Year after the “Feast of Stephen” a.k.a. Little Christmas. I’ve heard it said that Christmas is for kids, but I think Christmas brings out the kid in all of us! I take pleasure in the traditions of the season like the familiar tunes, movies, specials and family and friends gathering to share special dinners together around the decorated Christmas tree - to me the tree is like the centrepiece of it all. I have to confess, I celebrated once at Christmas without decorating a tree of my own. I felt empty without it, yet I had a few other decorations to keep things merry, I found myself wanting to visit friends and family more to enjoy their decorated trees. There’s something comforting about relaxing in my favourite spot admiring the tree and listening to carols on the stereo or online while sipping something warm to soothe my throat or enjoying a glass of Eggnog. No matter how hectic the season becomes, I always manage to allow myself time for quiet reflection. My childhood memories hold a myriad of joyful experiences and they remind me of a near perfect Christmastime. Sometimes, I wish I could travel back in time and wake up and be seven years old again still celebrating with those relatives long now gone when every moment was filled with wonder and I thought the walls would burst open from my excitement. Hearing certain carols always seems to transport me back to another time and place, stirring up special memories that I cherish. I don’t have the best singing voice, yet I sing anyway because it gives me pleasure. Sometimes I’ll be humming a merry tune and realize I’ve passed it along to someone else. I love when that happens. Sometimes, I rush to the TV to tune in for an old classic Christmas flick or an animated special that has the magic, similar to the carols, that brings forth the thought of goodwill towards others and keeping the spirit long after the season passes. “You’ll poke your eye out!”… “Perhaps Christmas, he thought, means a little bit more.” “God bless us, everyone” … and other Christmas flicks’ catch phrases bring forth great joy in my child-like heart. I recall once when things were hectic and I was unprepared for Christmas that I felt like Tim Allen’s character in Christmas with the Kranks because I wanted to escape it all or set the calendar back so I could catch up and be ready with less stress. That was in my College years. After that, I started to buy gifts off and on during the year and to make a few plans to better prepare for Christmas. I also started counting down the days to the next Christmas sometimes out loud and sometimes in secret. When I discovered there was a place with hundreds of people who enjoy the same special festive moments I’ve enjoyed all these years, I was overjoyed and a tiny bit shocked. I look forward to sharing many more Christmas memories with you while hearing about your plans, memories and traditions. Our celebrations have changed over the years and I’ve recently started a few traditions of my own. However, you choose to celebrate Christmas, remember it can be anything you want it to be and should reflect the love and passion you hold in your heart throughout the year. An so … this brings us to celebrating Day 2 of our Countdown to the start of the Christmas season … and tomorrow we will be treated with a special Day 1 post from SeaWaters. At the beginning of school, I do a unit entitled “On the Day You Were Born.” The kids look up information on the Internet and find out what songs, books, TV shows, movies, and toys were popular when they were born; what the phase of the moon looked like on the night they were born; political leaders; and some of the Academy Award winners, etc. In my classroom, I also have several framed pictures of myself when I was LOTS younger, (even before first grade!) that I use to “introduce” my family to my students. Normally I begin our writing sessions with “Did I ever tell you about the time…?” This-coming school year I plan to incorporate a unit on the 50s and 60s culminating in a “Sock Hop” and “Something Groovy” parties. Of course I have the music to go with those two units (some records and some tapes and CDs) which we listen to daily anyway. (Please tell me that some of you remember records!) Anyway, I use my memories, especially of these two time periods, to help create memories for my students and to capitalize on their memories in their writing. Those first days of school are really a wonderful time when the students write about their earliest memories, their funniest memories, their favorite holiday memories…. I was at school last weekend (yes, on a Saturday) and one of last year’s students and her mother, brother, and a friend saw that I was there and knocked on the door. They were at school roller blading on the blacktop of the playground. The first thing Jeanine wanted me to do was to “tell them the story about Scaredy-Cat Vickie” (my sister). I asked her which story. She said “The one where you made Vickie think it was December when it was really June.” So I ended up telling that one and a few more!!! I don’t think my students realize that when I tell those stories that I am really reliving those memories as if it were yesterday. Some of the voices in those memories have been silenced, but they still ring true in my mind. the day, or for many years, or stretching cycles of years…. What will I be remembered for? What memories will I leave with my students and my family? Will they remember…? What memories will have become a part of me? As a third grade teacher and a lover of Christmas, I have enough Christmas shirts, sweatshirts, and turtlenecks to last from Thanksgiving until January. I also have several Christmas lanyards for my playground whistle, and I have flashing Christmas necklaces and writing pens!! I adore anything "poinsettia" and plan to decorate the "Southern" way with poinsettias when our kitchen/family room remodeling is done. You might ask yourself what is the “Southern” way of decorating. I guess I should have said “a” Southern way instead of “the” Southern way. It goes back to Southern Living magazine which always has a wonderful Christmas issue and which also puts on gorgeous exhibits at home shows. Anyway, my mother adored poinsettias and had an idea of buying lots of them and placing them around the base of our Christmas tree. Wouldn’t you know it that Southern Living had the same idea!! Now, granted, their tree looked absolutely divine because it was either a silver-tip or one of those trees that is grown at high elevations. Ours was normally a cedar, but you just cannot beat the smell of a fresh-cut cedar. I would put our smell-good cedar up against a “home show” tree anytime. One year, though, my older sister just could not resist the lure of a Southern Living Christmas. We went to the home show in Charlotte, and she was entranced by one of the “theme” Christmas trees so much that she bought it right at the end of the show and took it home. It was beautiful with red and green decorations mixed in with pure white cotton bolls—yes the real ones!! That’s as close as my family ever came to a professionally decorated tree. Mostly, ours was filled with store-bought, homemade, and school-made decorations and a lot of love. I read a quote that I think applies to me: "So much of who I am is wrapped up in what it's about, because so much of who I am is wrapped up in my identity as a teacher." Through the doors of my classroom have passed all the students I have taught. If their voices were audible, what memories would they tell about? It reminds me of A Christmas Story in which Ralphie says his father's (curse) words are still hanging in the air over Ohio (I think it's Ohio)or was it Indiana? It makes me humble to realize that my words do have an effect, and that effect can be both negative as well as positive. I wonder what it would feel like to be Jean Sheppard, the writer of the book from which “The Christmas Story” was taken. Were all those wondrous words and memories swirling inside his head or were they put into a little bitty brain file cabinet or little bitty brain writer's notebook just waiting for the right page to come along? wafting through the open window in the spring and summer of my mind. time captured in a memory. It would speak of violet dusk and soft summer breezes. wanting just one more minute outside. and picnics down by the river. getting out to do it all over again. the noise of crisp, crunchy leaves. clinging to our hair and in our minds. tendrils of peach and lavender clouds. and sledding parties at night. And so we have come full circle to this, another beginning of collecting memories. Well, all I can say is Wow and Thanks! What a wonderful and inspiring series of special posts we have had. The expansion of interest for this thread in 2010 has been unbelievably remarkable and gratifying. Never in my wildest dreams would I have thought we could increase the posting by such a wide margin over 2009. What staying power Christmas has! While other institutions, governments and even whole societies and cultures have come and gone, Christmas remains and hopefully is here to stay as long as mandkind endures! Christmas Season 2010 is here and upon us!! Now onward to Christmas Day and New Years!! Thanks again for your continuous and continuing support!! Thank you, made!! Bless your heart! So excited to read through them all. Maebeary, xmas365, Christmasstar and 3 others like this. To me, this is what the season is all about, faith. We must have faith that each season will bring renewed hope for a better year. Horrible things are going on in the world, wars; famine and earthquakes top the news far to often. We worry about our health; finances; family and jobs. But for one brief moment in time we can focus on something greater than ourselves. We set aside what troubles us and peek into a barn at a baby asleep on the hay and marvel that the creator of the universe would humble Himself in this way. People are seen sneaking around and hiding things. Our kids seem to need very little sleep this time of the year and keep watching the sky to see if reindeer really know how to fly. So when those with no Christmas spirit, tell you it’s to soon, to commercial, to noisy, to bright, to wasteful…. Just smile at them and give them a bit of your faith in what you know the season is about to bring! As we enter into the darkest months, there shines bright a community here. Community: the gathering of souls who believe in a common cause and celebrate it routinely. However, our little community is hardly routine. We hail from global corners. We have never spoken nor seen each other in person. We are as diverse as the universe, yet we speak a common language. We love a period of the year where the world stops for one moment and celebrates as one. Truly, there are those wonderful stories of the holidays- where strangers reach out and celebrate with charity that all too often is lacking the rest of the year. Look at the dysfunction that exists in our world and the pending darkness. Yet, all year long, here, our community is brilliant in love, and support, and friendship, and charity. In my darkest of days, I remembered: there is something bigger than this despair. It is friendship and love and the commonality of something that we celebrate, even if the rest of the world, only catches on for a few brief weeks. And it is fitting, that ever so close to Christmas, after the 21st of December and the longest night of the year, the world again joins us and goes into the light. I want you all to re-gift this year. Yes, I want you to take this gift you were given, wrap it up in the prettiest ribbons, paper and bows, and then re-gift it… Who are you giving this gift too, what is this gift you are re-gifting? Your childhood… Once you have wrapped it up beautifully, I then want you to enjoy the anticipation of opening it up… Rip off those bows and ribbons; tear that paper off in shear excitement… Then embrace that childhood, for all too often in the hustle and bustle of a more, more, more world, I find we can lose sight of what sheer joy was / is. Here is your opportunity to enjoy Christmas once again, not through the eyes of your children, but though your child-like heart and eyes. I feel Christmas is a time when the world is renewed in the joy & hope of the season, that peace really can be achieved if we strive for it. The best of everyone comes forth, the Angels are living among us, and we all wish we could give more then we receive. You see I think Christmas gives everyone the opportunity to be a child. This Christmas I invite you all, once again or maybe for you for the first time experience Christmas with the heart of a child. Christmas, not New Years Day, is a time when we can start anew, fresh, begin again, be reborn, however you may want to look at it. You see it really is the perfect time, for this is when we are all feeling our best and most giving, we may even forgive those who have trespassed against us. So this Christmas, do not live Christmas though your Children, Grand Children, Nieces, or Nephews, (for some of us do not have any in our lives) live it as though you were a child, leave all your mistakes, regret, hurtful words (either said to you or maybe by you), and insecurities behind you, this Christmas start with a clean slate, see ourselves as the child we once were, or maybe wish we could have been; remember innocence, trust, sharing, and most of all kindness. The gift, so many meanings pour forth, how many stories and legends come from this, his gift was so precious, so now I want you to give it back to yourself, his gift, his spirit, start your life as you always wanted or maybe you are happy as it is, then cradle it, rejoice in it. Remember it is a gift, given to each and every one of us. Know that forever more you are a very special person who is an adored child on Earth, take this new you or rejuvenated you into the future, show this to all you meet. I received a card with this saying on it… May Peace be your priority, Hope your foundation, Joy your expression, and Love your gift!!! Let's all have a most wonderful, happy Christmas!!! It's time to feel anew! and shout out loud with joy and glee! The weathers getting cold and freezin! When everyone is full of cheer! You will get the feeling of being in heaven! and join Carl in the Conga Line! and celebrate throughout the year! and put on some ole Bing Crosby! To laugh it up and smile! and enjoy the Christmas love around! At this time of year, I always turn my heart toward home and look back into my childhood and recall all the blessings of my life. I know I am luckier than a lot of people for my loving family who embraced life and each other. Traditions were very special to us, especially at Christmas. The season began with Thanksgiving and went all the way into January when we kids returned to school. Those memories and traditions of dinners together, underwear and pajamas on Christmas Eve, Christmas caroling throughout our town, a party on Christmas Eve that would make you think that we were kings with all the bounty we had, scented candles in the windows, the smell of balsam and cedar, oranges with peppermint, homemade candies and cookies, hot chocolate with marshmallows melting on top, the lighting of the Yule log at the community center, treat bags for all the kids, midnight mass, the twinkling lights of the tree, and every once in a while a wonderland of whiteness on a starlit night. There were so many memories that it just makes my heart swell to recall them all. For those of you with no fond memories, take some of mine; or better yet, begin your own from this day forward. Whenever possible, life should be a pattern of experiences to savor, not to endure. I'm trying to recognize these moments now and cherish them. I'm just guessing; I'll never know. It's those little things left undone that would make me angry if I knew my hours were limited. Angry because I hadn't written certain letters that I intended to write one of these days. Angry and sorry that I didn't tell my husband and parents often enough how much I truly love them. I'm trying very hard not to put off, hold back, or save anything that would add laughter and luster to our lives. And every morning when I open my eyes, I tell myself that it is special. And so to all of you, my MMC friends: "May today there be peace within. May you trust that you are exactly where you are meant to be. May you not forget the infinite possibilities that are born of faith in yourself and others. May you use the gifts that you have received, and pass on the love that has been given to you. May you be content with yourself just the way you are. Let this knowledge settle into your bones, and allow your soul the freedom to sing, dance, praise and love. It is there for each and every one of us." And thus, dear MMC friends, we have come full circle since last year, and so it is now…the beginning of the new Christmas season. Many years ago a couple took a journey because of a census. The husband led the way with his wife seated on their donkey. She was growing quite tired and weary as their destination was so far and she was expecting her first child soon. When they arrived there was not any place they could stay. The only shelter available was in a place where cattle are kept and there was no bed for her baby. When he was born there were no fancy hospitals, no monitors to make sure he and his mother were okay, nothing but coldness and uncertainty about the future. The mother and her husband knew everything would be fine as they had great faith and they were right. As we celebrate Christmas let us remember it does not take money, extravagant presents, or bounties of fattening foods. It just takes being with the ones who are your family and being together. Let us embrace those we love and count our blessings and be kind to one another even if we have differences or are from different backgrounds, races, religions, etc. Let us remember we are all family and not just any family, Christmas family and that the little child who grew to be a kind and wise teacher celebrates with us. He lives in our hearts not one day of the year but all 365 if we let him. As we coast on into Christmas Season 2011, let me express my continuing gratitude for the loyalty and support of our fine members. Of all the board forums I have ever visited, I have never seen one with the level friendliness and comraderie to the extent I have experienced here. I can only assume it is because of the subject matter. Christmas just naturally draws out the best in people and draws in the best people. You hear more and more talk these days about how society is deteriorating and getting less and less civil. Well, to those disheartened folks I point to this site where just the opposite is happening! If you think about it, you'll realize just how lucky we all are to have found this little cyber home and to be a part of it. Enjoy the next 50 days to the hilt, my friends. You -- each and every one of you -- deserve it! AuntieMistletoeDear, Maebeary, xmas365 and 6 others like this. I love Christmas for all the right reasons. I love Christmas because of how I wake every Christmas Eve morning and still get the same feeling I had when I was 12. That's a tribute to my mother. She instilled in us the value of family, being together, and how it should be special. She recognized, with her mother's intuition, a long time ago that a day would come when we wouldn't all be so close to each other and that the distance would grow in more ways than miles. She made that time special because she wanted us to look back on those days as some of the most precious days of our life and long to be together again the next Christmas. I can still remember sitting in my Mother's lap on Christmas morning and feeling like the most special person in the world. I still get the same feeling each and every Christmas morning. I can still see my brother sitting there playing across from me or feel the wind in my hair as we rode our 3 wheeler together on Christmas morning. I can smell the fudge and cookies…and I can still vividly see the night that Santa came to see us because I had the brother who didn't believe. But to me….at this age….the fact that I can go to a place in my mind and see my Grandfather and Grandmother who passed years ago….when we were all together as a whole family…I am thankful for a mother who created that environment. I love Christmas because every Christmas tree is perfect. I love Christmas because of Christmas cards…. I love Christmas because I love giving to others. There is nothing like giving a gift or food to someone and knowing they are truly appreciative of you. I love Christmas because I work with kids. Being around kids at Christmas….it's almost magical….even the older ones. I love Christmas because of my wife. I'm a tough ol' coot. Not much rattles me….but the fact that I love someone so much that it can move me to tears….loving someone so deeply that you would literally give up your life for theirs….I never knew that kind of love until I knew her. Knowing that I have a Savior who felt the same for me…that's what my wife taught me about Christmas. I love Christmas because of the Christmas lights…. I love Christmas because I found and fell in love with all of you. Yep, I love Christmas for all the right reasons…. 5 more days until the season…. May your season be blessed…. There is a fable where a community survives due to a flame, lit continuously at the center of town. Members would regularly come to it. It provided light and warmth and each member of the town took turns guarding it, ensuring that the flame remained forever lit. The residents believed, that as long as the flame was lit, there would be good will, community, and joy. In a world, surely gone mad, where high wind and rising water seeks to destroy lives. Where divisions among its people , racially, culturally, economically, and politically, threatens to destroy any sense of civility. A world where vile and repugnant thoughts are allowed to dominate our airwaves. Yet, there still exists a community that is drawn to a flame. The flame of Christmas exists here forever in our community. In our darkest hours, we seek solace and peace from each other. We celebrate year- long a season of light and warmth, joy, and good will. And so it has come to this, four days till the season. Wow, what a year we had! On January 1, 2012 this thread was begun and it seems as if I blinked and here we are in the last three days before the start of the Christmas season! We not only passed last year’s total posts of 3110, we blew it out of the snow and we are not even at the end of the year yet. As we journey through these last few days before Christmas let us not loose our grip on the joy and excitement that has been building all year. Let’s sing our songs, decorate our homes and dance for joy as we spread the news that the sprit of Christmas is alive and well! So what do you think? Ready for some chaos? The little girl was 6 years old and just brimming over with excitement ! Christmastime had come again and it was snowing heavily. A thick sparkling blanket of snow was upon everything outside. It was Christmas Eve 1960 and Santa was going to make his annual appearance that very night. All was in readiness. Mom was baking cookies and was nearly finished. Dad was doing "dad" things. He always tape recorded Christmas morning on the "latest" in technology tape recorder so he could enjoy hearing everyone in all their Christmas excitement later on when all the chaos was over and he could relax and just enjoy his family. He was also preparing because he was going to record a talk he planned to have with Santa that evening for his 6-year-old. Her two brothers were being very secretive about something as well as her sister and everyone was feeling Christmas in the air. She did not know it but her two brothers had saved for weeks to buy their baby sister a giant stuffed animal dog with their paper route money and had sneaked it into the house, feeling very sly, without her knowing. Of course, her big sister was "in" on it. Christmas carolers had stopped by earlier in the evening and it was such a magical sight. It was just like a scene right from the little 6-year-old's favorite Christmas movie, A Christmas Carol !! The little 6-year-old was sure this was what heaven was like as she stood holding her mother's hand listening to the joyous songs of Savior's birth as the snow continued transforming everything with its soft, sparkling Christmassy glow. Soon it was time for her to go to bed so that Santa could arrive !! Her two big brothers and big sister tucked her into bed which had extra blankets given the chilly temperatures. The small fireplace in the bedroom seemed to have a special kind of Christmas warmth that night it didn't usually have. When the little girl was settled in and was comfy her big brothers and sister began to softly sing to her....the same familiar carols she had heard every Christmas but she loved hearing them. This was a ritual every Christmas for her siblings to tuck her in and then sing carols to her. She was far too excited to sleep and she loved being with her siblings. Years later the little 6-year-old girl is now grown. She still remembers those magical Christmases with her dear brothers and sister singing carols. Though her family are mostly gone now except for her sister, she still feels them in her heart and remembers the precious gift Christmas and family gave to her and still gives her. Merry Christmas, my dear Christmas family. I love you all. The little girl came into her papa’s study, as she always did Saturday morning before breakfast, and asked for a story. He tried to beg off that morning, for he was very busy, but she would not let him. So he began. “First-rate!” said the little girl, and she nestled into a comfortable shape in his lap, ready for listening. Once there was a little girl who liked Christmas so much that she wanted it to be Christmas every day in the year, and as soon as Thanksgiving was over, she began to send postcards to the old Christmas Fairy to ask if she mightn’t have it. But the old Fairy never answered, and after a while the little girl found out that the Fairy wouldn’t notice anything but real letters sealed with a monogram. So, then, she began to send letters, and just the day before Christmas, she got a letter from the Fairy, saying she might have it Christmas every day for a year, and then they would see about having it longer. She had a splendid Christmas. She went to bed early, so as to let Santa Claus fill the stockings, and in the morning she was up the first of anybody and found hers all lumpy with packages of candy, and oranges and grapes, and rubber balls, and all kinds of small presents. Then she waited until the rest of the family was up, and she burst into the library to look at the large presents laid out on the library table—books, and boxes of stationery, and dolls, and little stoves, and dozens of handkerchiefs, and inkstands, and skates, and photograph frames, and boxes of watercolors, and dolls’ houses and the big tree, lighted tree standing in the middle. The little girl slept very heavily and very late, but she was wakened at last by the other children dancing around her bed with their stockings full of presents in their hands. “Christmas! Christmas! Christmas!” they shouted. There was the Christmas tree blazing away, and the family picking out their presents, and her father looking perfectly puzzled, and her mother ready to cry. “I’m sure I don’t see how I’m to dispose of all these things,” said her mother, and her father said it seemed to him they had had something just like it the day before, but he supposed he must have dreamed it. This struck the little girl as the best kind of a joke, and so she ate so much candy she didn’t want any breakfast, and went around carrying presents, and had turkey and cranberry for dinner, and then went out and coasted, and came in with a stomachache, crying. Now, the next day, it was the same thing over again, but everybody getting crosser, and at the end of a week’s time so many people had lost their tempers that you could pick up lost tempers anywhere, they perfectly strewed the ground. The little girl began to get frightened, keeping the secret all to herself, she wanted to tell her mother, but she didn’t dare to, and she was ashamed to ask the Fairy to take back her gift. So it went on and on, and it was Christmas on St. Valentine’s Day and Washington’s birthday, just the same as any day, and it didn’t skip even the First of April. After a while turkeys got to be awfully scarce, selling for about a thousand dollars apiece. They got to passing off almost anything for turkeys—even half-grown hummingbirds. And cranberries—well they asked a diamond apiece for cranberries. All the woods and orchards were cut down for Christmas trees. After a while, they had to make Christmas trees out of rags. But there were plenty of rags, because people got so poor, buying presents for one another, that they couldn’t get any new clothes. The only ones who didn’t become poor were the confectioners, and the storekeepers, and the book-sellers. After it had gone on about three or four months, the little girl, whenever she came into the room in the morning a saw those ugly lumpy stockings dangling at the fireplace, and the disgusting presents round she burst out crying. In six months, she was perfectly exhausted. And how it was on the Fourth of July! The first boy in the United States woke up and found out that his firecrackers and toy pistol and two dollar collection of fireworks were nothing but sugar and candy painted up to look like fireworks. Before ten o’clock, every boy in the United States discovered that his July Fourth things had turned into Christmas things and was so mad. Nearly everybody had built barns to hold their presents, but pretty soon, the barns overflowed and they used to let them lie out in the rain, or anywhere. Sometimes the police used to come and tell them to shovel their presents off the sidewalk or they would be arrested. The little girl went to thank the old Fairy because she had stopped its being Christmas, and she said she hoped the Fairy would keep her promise and see that Christmas never, never came again. Then the Fairy frowned, and said that now the little girl was behaving just as greedily as ever, and she’d better look out. This made the little girl think it all over carefully, and she said she would be willing to have it Christmas about once a year. Then the Fairy said that was the good old way that had pleased people ever since Christmas began. And thus, we have come full circle since last year, and so it is now…the beginning of the new Christmas season. God bless us, everyone! Folks, it's all been said by our special posters whos literary talents dwarf mine. But to tell you the truth, I couldn't be more pleased. It is clear our members truly love and are moved by the Christmas Season. What we all here have in common. During his variety show back in the 1960's, Jackie Gleason used to say "The Miami Beach audience is the greatest audience in the world". Well, what we have here my friends is the greatest, nicest, friendliest and most festive forum on the entire internet. When was the last time you read an unkind word or a put-down here? Compare with other forums you have no doubt seen and tell me I'm not right. Happy Christmas Season, my Many Merry and Marvelous Friends. You deserve the best and you have it here! Thank you so much for your dependable support this year. And I look forward to many more years of counting on you and with you! Four and a half years ago I was at a pretty dark spot in my life. I had lost the love of my life. Found another girl that I thought could show me that I was still capable of love only to have her betray me and damage my heart even more. I had a job traveling around as a sales rep. I loved it. There was no co workers to deal with on a daily basis. I only saw my boss 3 times a year. It was just me and that was the way I preferred it. I could run into a store and pretend to be happy while trying to sale the manager whatever new product I had that period or to tell them about the specials going on then go back to my truck and wallow in my own pity. I had pushed almost of all my friends away and the one's I still bothered with, lived out of state. Most of our interaction took place over the computer. So they had no idea that the happy act that I but on every time I talked to them was all a facade. I even hid my depression from my family. I would tell them that I was going out with friends and just go drive around all night so they wouldn't question why I was staying at home so much. I was at a point that I really didn't want to interact with anyone. Then one day I was sitting at the desktop computer in my bedroom when out of no where I wondered how many days are left to Christmas? I don't remember the exact words I typed into Yahoo that day but as I scrolled through the results I stumbled across mymerrychristmas.com. I clicked on it and was amazed by the site. Not only did it have the countdown to Christmas that I was looking for, it had all kinds of info on Christmas. Now I had always loved Christmas and listened to Christmas music and watched Christmas Movies all year long. I had never really studied Christmas though. So to see all of this info in one place overwhelmed me. I also noticed that the site had a forum. I had read forums before to stay up to date on Nascar and other sports but I had never actively joined in. As I read through the posts that day though, something struck me. I had this overwhelming urge to join. So I listened to it and joined the site. I posted an intro and looked around. I was amazed how active the forum was even in April. Eventually I stumbled upon the Countdown thread. I posted about what was going on in my day and read about everyone else's day. Then I shut the computer down and went to do some other things. The next day, I was on the computer checking my email, when MMC popped in my mind. So I searched for it again and did some more reading. Then I logged back on the forums and read some more there. Before leaving I once again headed to the countdown thread and posted again. That same scene repeated itself again and again. Finally about a week later I bookmarked the site so I didn't have to keep searching for it. I couldn't really explain it but for some reason I just liked it here. The people all seemed to be nice and cared for each other. There was no fighting, no arguing, no complaining. It was just a bunch of people who loved Christmas like me. As the weeks passed, my daily visits became 2 or 3 times a day. I found myself replying to other people's posts. Playing the games. Chatting with Coach about Nascar. In a way, I started feeling at home. Which shocked me. I never believed that I could care about people that I had never met. In fact at that point, I wasn't sure that I could ever care about anyone again. I found myself thinking about other member's randomly throughout the day though. Praying for those that needed prayers. Wondering if people who said they were sick, were feeling better. It kinda scared me to tell you the truth. I didn't want to care. I viewed MMC as a way to kill time during the day. I wasn't trying to make friends. I wasn't trying to get to know people. This wasn't part of the plan. Soon I couldn't deny it anymore though. I did care about all of these people. It was more than that though. I enjoyed hanging out on the site and chatting with them. It made me happy and that happiness was carrying over to my everyday life. All of you were helping me to claw out of the dark hole that I had been stuck in for so long. I wasn't sure how or why but you were and Christmas that year was one of the best that I had had in a long time because of it. Year's later I can look back and see what was going on. I still loved Christmas but I had lost my Christmas spirit and MMC helped me find it again. In the process, it also helped me find myself again. It showed me that I was still capable of being happy. That there was people who would like me for who I was and not who I was pretending to be. That my heart though broken was not dead. That it was still capable of feeling emotions and of caring. I don't want to be to dramatic about it but in a way MMC saved me. Had fate not caused me to stumble on to this site that day back in April of 2009, I don't know where I would be today. I'll admit that it's still a struggle some days though. In fact there was a time earlier this year that I really felt myself slipping back to that place again. It just seemed like everything was going wrong in my personal life and all of that emotion was overwhelming me. It was 2 very special friends from here though that realized what was happening and stepped in to pull me out of the downward spiral. For as far as I had come from where I was back in 2009, I still couldn't bring myself to let anyone in. My heart just wasn't ready to trust anyone with those thoughts for fear of them being used against me. Through their persistence though, those fears lessened and I slowly started opening up for the first time in my life. I'm in a much better place today because of it too. So as we prepare to celebrate this Christmas season, I want to take this chance to thank all of you for the things you do. Not just here in the countdown but also the things that happen behind the scenes that no one will ever know about. Thank you for the kind and caring messages. Thank you for the prayers and get well messages. Thank you for the support in the good times and the bad. Thank you for your selfless acts and for the surprises. It is all of you that make this site so special and I'm honored to call you all my friends. And so it has come to this..
Four days until the season..
Christmas is coming again, as it does faithfully every year. It will come no matter what is going on in the world and in our lives. We together have faced a year of great joys, welcoming new lives into the world and great sorrows in saying goodbye to friends, family members and beloved pets. Praying, laughing and crying together as we shared those moments in our lives that we just knew others here would understand. From daily conversations, to those special times of community chats, Christmas in July and greetings on the podcasts. With the ornament exchange and the mailing of Christmas cards, we bring Christmas into each others homes from around the world. Our very own Kringle radio keeps us dancing to Christmas tunes all year long. Of course we cannot forget the main event party of the year, “The Worlds Largest Christmas party”!!! The only one you can attend without the worry of what to wear. So celebrate the birth of Jesus and the miracle of His coming. Get together with family and friends. Believe in Santa Claus and his magic. Give to those who are not as blessed as you are. Brighten those dark nights with bright lights and beautiful decorations. Be excited, the Christmas season is about to begin! On Jan. 30, I found out my world (my wife) was about to produce something that would become my world (my child). I wanted to tell my family so bad, but I had to wait….Wifey wanted me to do so. So I came here and told my “other family” in this post…. I'm going to be a Dad…shhhhh….."
Shortly thereafter….the congratulations started coming in….but there was one….there was one that stands out now…. Oh Coach !!!!!!!!!!!!!!!!!!!!!!! WONDERFUL !!!!!! XOXOXOO. And as I reflect on that post over the past few months, I realized it (the post) was one of many….there were so many other instances of kindness…. The ornament came yesterday and it is SO WONDERFUL !!! Hi Coach ! That is so sweet !! You are such a kind man. Your wife is such a lucky lady as are all the students who have the pleasure to know you !! Coach, I hope you are doing well. There was more than that to me…but when you started looking, it was mind boggling how many more there was to others…. There is more….so much more….I could go on and on….because for CM3, kindness is who she was and it was what she brought to us….her gift to us. See….in my world….I thought about the fun that would be had in the thread. But CM3….she didn’t bring fun to our world. To her, this was an opportunity to bring compassion. I think about all the compassion she brought to the board, the compassion she had for her animals (and ours), and the compassion she had for us. I wanted her voice to be heard…I wanted her to lead us into the season….so I found this quote from her…and I think I want it to help to do just that…. As we head into the season, let’s remember those of us who aren’t here….and how their experiences helped mold us into who we are…. As the days have turned to hours in our countdown, I pray that we all keep the spirit of compassion that CM3 brought to us…and I pray you have a Merry Christmas. This is not my style, I like to post in the "privacy" of the blogs, but our most special friend would be most proud of me doing it this way. I am anxious, but it is my time to do a little extra for MMC. It was over for most of the world, the greatest day of the year had come and gone. the wrapping paper still strewn on some floors across the country, and I am sure there were some lonely Christmas trees already on the sidewalk. I have a friend that is that way, you build up the hype and the fun just to throw it out the door as soon as Bing, Nat, and all the other crooners voices have not even finished echoing from the radio. It is not the end, but the beginning. We may be sad at that time, but we know there are only 364 days to countdown to make the next year even better. As we began that journey on the way Christmas 2013, the friendship here grows, we share our lives on The Countdown thread, we pray for each other, we care for each other, we love each other as family. We cry for our friends at the loss of a pet, we give a shoulder to one who needs it. We private message each other when we have a concern. We have become a family in the most 21st Century way. This journey has had its share of laughs, heartbreak, loss, and strength. The absolute darkest part of this past year happened back in April, we lost probably our most beloved member, Louanne, Caninemom3. As for me and probably a lot of others here, she was the first to introduce herself to a new member. We became very close in a short amount of time, I was able to confide in her because she was always there to lend an ear, a shoulder to cry on, or one of her special (((hugs))). I, like most of us, was absolutely devastated by her passing, I cried gallons of tears for someone I never met in person, but my heart could not help but feel torn. I was very close to leaving MMC at that point, the pain of coming here was too much to bear. Then the strength of this community reached down and grabbed me by the shoulders and held me firm, two of you especially, I am sure you know who you are and how you made me see how much more important it was to be here than leave. Thank You so much. We moved forward, we grew closer as a community, our family full of love soon was able laugh again, grow closer and celebrate little things together. Who will forget Christmas In July and #blamesugar, I still laugh thinking of that. Valerie, Chad's blue shirt, and some of the wine induced laughter brought on by QVC. The 'Bers, where else can a bunch of us go nuts over the last three letters of a month. Celebrating the birth of one our members daughter, the pure happiness we felt for Coach as we read his heartfelt posts about becoming a father. The journey was getting higher, getting closer, Halloween, sharing our decorations, the candy we enjoy, Music Choice Xmas music. It is getting closer, you can smell it, you can taste it, Christmas is becoming visible. Here it is, November 12, the journey has brought us to the peak. Look down everyone, you can see the tree at the bottom this mountain. We have made it to the top, it is all down hill as the season starts tomorrow. Let's get ready for this rush, it always goes way too fast, let's enjoy this to the fullest extent. Do the little things, enjoy the thoughts of Christmas. Celebrate Louanne this year, as she taught us all so much about her love of Christmas. Put a polar bear in your nativity, as we all knew she had a whole menagerie celebrating the birth of Jesus in her nativity scene. We love you Louanne, we will celebrate this Christmas as we always do, but it will be done with you deeply in our hearts. You led us on this journey, you were the strength, the heart, your legacy is the love that is here. Thank you my friend. Merry Christmas. The season is less than 24 hours away, let's get ready to party MMC this is our time of year. The journey is nearly complete. Well, what a fantastic Special Post Series it has been. And what a wonderful run-up to the Season we had last night. In recent years, we have heard alot about the value of "diversity". Diversity does indeed have its place but it seems to me it's the primary cause of conflicts. By contrast, what I have noticed on this site over the years is the value of non-diversity. It is our COMMONNESS of feelings, interests and beliefs that has united us into a wonderful close-knit community that has been remarkably conflict-free. Here. One place. One santuary. One location where everyone feels at home and comfortable with each other. Enjoy the 50-day Christmas Season to the fullest, fellow Christmas Comrades in arms. And feel as one and at peace. AuntieMistletoeDear, Maebeary, xmas365 and 5 others like this. what a delight! I love having a look back in time at all of this. Thank you so much for taking the time to do this. AuntieMistletoeDear, Maebeary, xmas365 and 2 others like this. What a great post! And an honor to be amongst the many posters who have made the Christmas season better for me for years now...God Bless Us Everyone!!! Nothing is more important than the soundtrack!!! AuntieMistletoeDear, Christmasstar, xmas365 and 2 others like this. Thank you, made. Tough to read Louann's final special post. At least she's with the rest of her family now... and her family here certainly misses her. "The bells, the bows and the flashing lights, the mistletoes and the 'Silent Nights. It's all for show, but that's all right. That's not why I love this time of year..."
RadioJonD, AuntieMistletoeDear, Christmasstar and 2 others like this. Nice consolidation, Made! Thanks for thinking of it! And now, a nod to even further back! Although I don't post often, I pop my head in almost daily and read what I can...And today, when I saw the countdown I was flooded with memories of Christmas.com and Gracie, and Cherie and Crown and Binger, RadioJonD and the many folks who I found one evening while searching for like-minded Christmas lovers...And then when sites were born, and then disappeared, we all came here to celebrate the season with Mr. W and all the good folks already here. It has been my home since. And if everyone is still up for the minute by minute countdown on the evening of the 12th, I'd like to join in if I may! We are so close to our beloved Christmas and after the year we've had, I am SO looking forward to it! AuntieMistletoeDear, made582, Christmasstar and 3 others like this. Yep, you heard it here. The world may tell you otherwise, but I’m telling ya the truth. Santa is real. As we grow older, we become more skeptical of Santa, but don't ever doubt Santa. When I was a kid, I saw the carrots on the roof that the reindeer ate. How else would those carrots get there? THEY WERE EVEN CHEWED(or so our little minds told us). Every Thanksgiving night, my brother and I would set out our letters to Santa and a few hours later, we would hear this bell ring from outside. That bell let us know that Santa’s elves came and got our letter. How else could you explain us getting the things we asked for during Christmas? What about the milk and cookies we set out every Christmas Eve? Where did those go? HELLO! They went to Santa! Have you ever tracked Santa? Do you remember the newscasts when Santa showed up on the radar on the local news at 6:00 and 10:00? For crying out loud…NORAD tracks him! You can’t fake that! Santa Claus isn’t real? Have you ever seen “The Santa Clause” parts 1,2, and 3? Are you telling me these aren’t real? Tim “The Toolman” Taylor is Santa! He has to be! More importantly, have you ever seen Santa walk into a room full of kids? Have you ever seen them in line to see Santa at the mall? Have you ever seen the look on their faces, heard the excitement in their voices? Friends, that anticipation in their eyes speaks to all of us. It says that Santa, in a way, is as real as it gets and Christmas is good. That look says I love the people who brought me to see Santa and I can’t wait to spend Christmas morning with these people. This, my friends, the feelings, the anticipation, the love….you can’t fake that. As we get older, that feeling is what we are left hanging on to. Some people go through life and never lose that feeling, while some of us lose it and come back to it later in life. Regardless, the feeling of family, love, Christmas with those who mean the most….that is the same feeling we got on Christmas morning when we “believed.” You can’t deny that feeling, you can’t hide it, and you sure can’t fake it. That feeling is how I know Santa is real. That feeling is what we live for. Santa is real, friends. He is alive and in all of our hearts. I believe in Santa and I believe in the Christmas spirit. And like Christmas, Santa is coming…. And like Christmas is coming, and like is Santa coming….so is “Little Bambina #2”. May God Bless you as much as he has my little family in the past week. And so it comes to this…..5 more days until the season…. At the end of the iconic film " Gone With The Wind" Scarlett O Hara is left defeated, broken, and alone. And in her despair, it comes to her.. "there is something far greater that delivers you.. it is the land.. and Tara.."... and while we do not in our every day lives come close to the challenges of nineteenth century living, we are daily reminded, that in our darkest of days, there exists something far greater, and it is community, faith in each other, and Christmas. We found each other in a common love of the holidays and in that which only for a brief period, calms a world surely gone mad. There is something far greater that the mayhem and chaos of the world. And for us, that is each other and, Christmas. And so it has come to this, Four days until the season. Christmas is not just a date on the calendar, it is a place in our hearts. How you keep Christmas is as unique as you are, that is why you cannot do it wrong. Some decorate every inch of their home inside and out, while others only put up a small tree. Gifts can be bountiful and expensive or just one small inexpensive item. All of it is right. We create lasting memories and traditions along the way that can last for generations. Christmas is love in action. The greatest love of all was a baby born in a stable marked by a star that first Christmas. Christmas is for all ages, all nations, all economic groups. Christmas is the most amazing time of the year when good will to all is abundant. A time to give and to receive. So make Christmas what you want it to be, but make it a good one because in 3 days the season begins...are you ready ? "So the legend of Saint Nicholas is a lovely and delectable myth, the last living relic of the vanishing world of dreams. The fairies are gone. No little children or maidens watch any longer through the ardent summer nights to catch some echo of the songs. The witches are gone...Santa Claus alone still lingers with us. For Heaven's sake, let us keep him as long as we can. We are now two days away from the most magical time of the year, a time we all look forward to starting December 26 the year before. As our friend Ballcoach so eloquently put it, "Santa Claus is real." In this season we have been looking forward to, I am a little hesitant to go through it as I usually do. My oldest is 9 years old, and I worry that this may be the last year that Santa Claus may exist for him. He was very skeptical last year, and a lot of questions were beginning to come. He would ask very vague questions, and we would answer how we could without ruining it for him. He wants to believe, you can see it, but I have a feeling that peer pressure is getting to him, and we will be telling him the everything sooner rather than later. So this year let the magic flow, let Santa be the big guy to the children for as long as you can. This magic from my youth has made me such a lover of Christmas throughout my life that I want my kids to have that same feeling that I still get, the smile I get as Christmas gets closer. That feeling that fills your heart during this time of year. The warm smiles from strangers. The anticipation of Christmas morning that makes it so hard to fall asleep, and wakes you up before the sun comes up. Christmastime is nearly upon us, the build up of the season is culminating, get the decorations out, get the lights out. 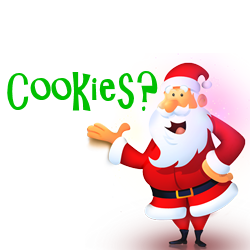 Make some cookies, and eat them as Santa would. Most of all share it with your loved ones. Make the most of this season, enjoy it, and try not to let it go too fast. I look forward to celebrating this time of year with all of you again. I make notes all the time in my writer’s notebook where I keep track of words, phrases, memories that I want to refer to as I write for scrapbooks, journals, letters, etc. Amidst the rush to possibly see my son for the last time, I forgot where I put my writer’s notebook.Even though I did forget that, I did not forget what was in my heart. For me, Christmas is a time for reminiscing, of bringing those memories to the forefront. I once wrote to someone on MMC that traditions are a part of the glue that holds us together. They are not necessary, but they sure are comforting.If you ever find yourself at a point where you have to start over, don’t leave your traditions behind.They bring a sense of continuum to our lives, and they bring comfort to our children.The pain, though, is when one of those children is missing; it is also hard when one of the adults is missing.And it doesn’t even have to be that someone is missing.If a situation is so changed, that, too, can have a devastating effect.The thing is, we (have to) go on, no matter what.When my son was diagnosed with leukemia the day before Christmas Eve in 2007, I thought I would die.But life did go on.I was so subdued at Christmas, that I could hardly listen to Christmas music.Then I found out that keeping up that tradition was what helped me get through the holidays.At that point, I felt like all I was doing was “getting through.”Previous to that in 1999, my daughter had a stroke at 22 years of age.As a result, my granddaughter was born with cerebral palsy and had just gotten out of the hospital before Christmas.Twenty-two years earlier, my husband at the time, decided he didn’t want to be married; and he left when my daughter was three days old.Even though it was the first devastating thing to happen to me as an adult, it was also the thing that made me stronger.At the time, I couldn’t see that.But I carried on, on behalf of my children.There was really nothing else I could do.Then during Christmas 2011, I realized that I had cancer.It was scary, indeed, but nothing compared with those events that involved my children.I wish I had words of wisdom to share, but I do not.It is easy to say that time heals all wounds, and it does; but it doesn’t feel like it when you are going through a situation and when your heart is breaking, such as this past October when we found out my son’s cancer had returned as esophagus, colon, liver, and stomach cancer. As a North Carolinian, I have always loved the writings of Thomas Wolfe from Asheville. Two of my favorite books by him are Look Homeward, Angel and You Can’t Go Home Again.Wolfe borrowed the title for You Can’t Go Home Again from a conversation he had with another writer.In the book, the main character realizes that "You can't go back home to your family, back home to your childhood ... back home to a young man's dreams of glory and of fame ... back home to places in the country, back home to the old forms and systems of things which once seemed everlasting but which are changing all the time – back home to the escapes of Time and Memory." I used to teach my students about “Makin’ Memories.” I don’t think they realized that when I told them my family stories that I was really reliving those memories as if it were yesterday.Some of the voices in those memories have been silenced, but they still ring true in my mind. What will I be remembered for? What memories will I leave with my own kids and with my former students?Will they remember…?What memories will have become a part of me? I constantly ask myself how did that time get to be so long ago? One evening during Christmas, I withdrew a picture from an old album, reminding me of those long-ago memories and reliving those scenes as if they were just happening.Throughout that evening, those memories paraded past my eyes and my heart. Later, in the glow of the streetlight filtering through the open drapes, we all looked like ourselves again. Tootsie with a new perm, Tim wearing his cowboy gloves and sporting his toothy smile, Daryl grinning while holding his Hopalong Cassidy rifle, and Vickie without wrinkles or splashes of gray in her hair.I was holding the hand-me-down doll and the box in which my new Brownie had recently been nestled.Reluctantly, I opened the photo album and replaced the picture in its proper spot.I knew, God willing, I would do this again next Christmas, just to see if the ghosts of Christmas past would come and visit. Signing off as usual: And thus, we have come full circle since last year, and so it is now…the beginning of the new Christmas season.God bless us, everyone! As my past becomes longer than my future, I look more sentimentally at Christmas and its wonderful feeling. I look for it in the music and the holiday decorations. I search for it in written passages. I seek it in the faces of my remaining loves ones. And I yearn for an articulate way to express it. Us oldsters remember the old Honeymooners television series. In my effort to find the best description of the feeling of the Christmas Season, I don't believe I've come across a better one than that expressed by Jackie Gleason's character Ralph Kramden. It it, he sums it all up beautifully. I urge you to watch this fine Christmas 1955 episode but if time does not permit, skip ahead in the video to 23:10. This is where Ralph wonderfully states how he feels about Christmas to his wife, Alice. Have a really Thoroughly Thrilling Thursday, a Merry Christmas, and a Stupendous Start to Christmas Season 2014, my fine fellow travelers! In case I didn't mention it before; thanks for doing this - it's always nice to visit festive posts again. It's like taking a snapshot and framing it on the wall. Ryan and snowflake22 like this. SPECIAL POST NOVEMBER 8, 2015? turning to my mom and saying "I got it because I said God bless you when someone sneezes." My mom smiled at me. passed away about 6 weeks later. very few things we can count on getting BETTER each year is the Christmas season. have December ahead of us...the month of Christmas. of the year because of course as the saying goes "save the best for last." me and for accepting each other. present and making new Christmas Season memories every moment that you can this year. that is steadfast in holding on to the very thing that harkens us back to a simpler time. thing in common: we love the holidays and we daily think about each other. the family of My Merry Christmas. And so it has come to this: four days until the season. It is a time of giving and receiving. in a barn, a dirty smelly barn. just doing their job looking after the sheep. was a baby born in this barn ! of telling a story that left you feeling like you were there too. than the one who receives. May the miracle of Christmas, past and present live in your heart forever. before by others, far more eloquently, but it bears stating again: we’re a family. Christmas Spirit in July more than he has in December. I have to say I agree with that. putting forth those values associated with Christmas such as love, peace, and goodwill. my next thoughts with some lyrics from Kermit The Frog. ready to fully Blossom before our very eyes. evening, once again, we will come together as one and welcome the 2015 Christmas Season! counting down with you tonight, in real time. What a great year! Another fantastic countdown. What keeps us here and keeps us coming back day after day and year after year? Our common love of Christmas and its wonderful surrounding Season, of course. But more than that, I think all of us know something truly good when we see it. while wrapped in the contex of a deep, common interest. Ryan, DoYouHearWhatIHear, MsRose and 1 other person like this. Today starts our 5 day countdown to the start of the 2016 Christmas season. It also happens to be the day nine years ago I joined this amazing community of people who share a common love of all things Christmas. But it is so much more than just a love of Christmas shared that now binds us together. This has become a close community of people who have become more like family. A place where people care enough to ask how you are doing and actually listen to your reply. This is the time of year when it seems most of the world finally sees what we see all year long. It is a time of sharing and loving, of going the extra mile for others. It is a time of helping others and giving to those who have need. To say a special thank you to those who have helped us in times of need. A brief window of good will to all. Christmas has always been my favourite time of the year. I love everything about it. Lets work to make this year the best celebration ever ! The journey has been wonderful so far and I thank you all for the love, encouragement and support through good times and bad. I look forward to many more years with you all. The Season- a time to remember " I am my brother's keeper"
Let me start my post by saying Happy Birthday to the United States Marine Corps!! It gave me a home,family,brothers and sisters for many..many..years. In its own way the Marines created the Christmas Fanatic I am today. It is true that I spent many Christmas Seasons deployed and away from family,friends/loved ones but I always kept the spirit..so lets get started. Christmas holds no religious symbolism to me anymore,but for those of you that does..I say "Hold onto your ideals and cherish them". Christmas Season means hope! The decorations go up,lights start to twinkle,cookies start to be baked, expectations of what is to come. You can see for the most part people begin to transform into a kind human being and with this I begin to feel like a child waiting for Christmas morning. Everything about Christmas gives me the childlike expectations..so in a way you can say this is why I leave stuff up all year. It reminds me of better times and that there still is hope left in the world. Do I believe in Santa Claus? Most definately I do, I believe every single person is Santa Claus in their own unique way. So our days are closing at a rapid pace until the season begins. I ask...Will you be Santa this year? "To all my fellow Marines that are no longer able to celebrate the Season and Christmas with me, and most importantly your loved ones. I remember every single one of you, and how we celebrated the best way we could at the time. I shall hold the Christmas spirit for you in trust, never retreat from it and hope that we can share a candycane again. I loved every one of you. Thank you MMC and Crown for providing me a day for the countdown!! Each Christmas season, I look forward to "catching the Spirit." To feeling that tingle of joy in my soul and to smiling, to finding peace on earth and goodwill towards all, to relaxing and feeling just for a moment that all is right and will be alright with the world. For whatever reason, the last two years, it's been hard to find that. A loved one passed. My job doesn't allow my husband or I to have a full holiday off really ever anymore. I've seen too much in the world to really "let go." Like the carol "I heard the bells on Christmas Day," I felt the lyrics, "And in despair, I bowed my head. There is no peace on earth, I said. For hate is strong and mocks the song of peace on earth, goodwill to men." But this season, I am determined. The world needs Christmas' powerful Spirit more than ever. I think we each need the Spirit more than ever, too. I have been working to open my heart to the joy of Christmas for some time now, and soon, it will be here. So soon. So, I encourage you to do the same thing. Acknowledge what is difficult in your life and the world. But don't let it steal your joy of the season. Open your heart to the Spirit of Christmas and find joy that you thought was forgotten. Not everything will go perfectly or even the way it should, but that is what our MMC community is here for. We are here to support, and to remind each other that the Spirit of Christmas is a powerful thing, a powerful force that can bring us together and help us be more joyful and hopeful as we approach the season and the day itself. Find the moments of joy, hold onto them, and celebrate with everything you are and everything you've got inside of you. You may be surprised how the Christmas Spirit stays with you all through the year. Let's celebrate, friends. Let's celebrate. There are many words we can use to describe the Christmas Season. I, for one, prefer to rely heavily on a few. The feelings anticipation I experience all year when thinking about Christmas is absolutely incomparable to anything else. The feelings of joy and excitement that overcome me when I walk into a store and see my first Christmas item or ornament, or put up my first Christmas decoration while listening to Christmas music in my home have such a heartwarming, yet teary-eyed feeling of anticipation. Although we have a safe haven here at My Merry Christmas, the “real world” often looks at me sideways due to my fascination with all things Christmas. I don’t mind that at all. Christmas, to me, is an escape from the “real world.” Christmas lets me believe that there is still a place for hope, pure joy, peace, and innocence – we just have to believe. Despite all the hardships and despair that may be going on in various places of the world, I believe it is something we can overcome. I believe in the Spirit of the Season, and I believe that it can unite everyone regardless of their beliefs. I believe in a Season that we countdown to all year. I believe in a Season that can produce six weeks of happiness. I believe in a Season that heightens our innocence of yesteryear. Most of all, I believe in a Season of peace. Speaking of believe, Kim’s six-year-old nephew was told by his older (about 10 years old) cousin this summer that there was “no Santa Claus.” Six years old, can you believe it? Needless to say, Kim, myself, and her family were both shocked and appalled at the news. We all quickly reassured him that there is, indeed, a Santa Claus. “What about all the cookies, I suppose parents eat them, too?” to quote Buddy the Elf. Kim’s nephew took a stand. He agreed. No Santa? There is a Santa. And the best part about this? His two older brothers, who will be 10 in about two weeks, know the truth, but they also reassured him that Santa is real. In my mind, everything can happen if you just believe. I believe in the magic of the Season, and I believe that there is no other time of year like Christmas. I believe that being able to spend a bond of Christmas with all of you throughout these years – a total of seven years for some – has truly made me a better person. I believe that is nearly time to turn on the Christmas music. I believe that is nearly time to decorate. I believe the Christmas Season is only one day away. I believe we will be able to say those two magical words to ring in the Christmas Season very shortly. I look forward to saying the two magical words and counting down with you all tonight, in real time. AuntieMistletoeDear, Ryan, NcGunny and 1 other person like this. Well, another fantastic Season count has been completed. The Special Post series has inspired us. Last night's real time count entertained us and drew us closer together. And the final run to Christmas Day has commenced. We come here year after year for camaraderie, fun and a commonality of interest within the warm and beloved framework that is Christmas. This dependability is clearly important to us all. A tradition we feel compelled to uphold for all of our sakes. And thank goodness for that! Thank you so much for counting down with us for yet another year and for the optimism I know will guide us forward here for many years to come. Now on to Christmas, dear Friends. Enjoy the next 50 days of Christmas Season 2016 to the fullest and celebrate in style! AuntieMistletoeDear and Ryan like this. Thanks Made, for going to the trouble to do this. Nice to have these all together! Thank you, @made582. I appreciate you collecting these.